The weather is finally starting to warm up, the kids are out of school and we just took our first dip in the pool this past weekend. I love summer time! 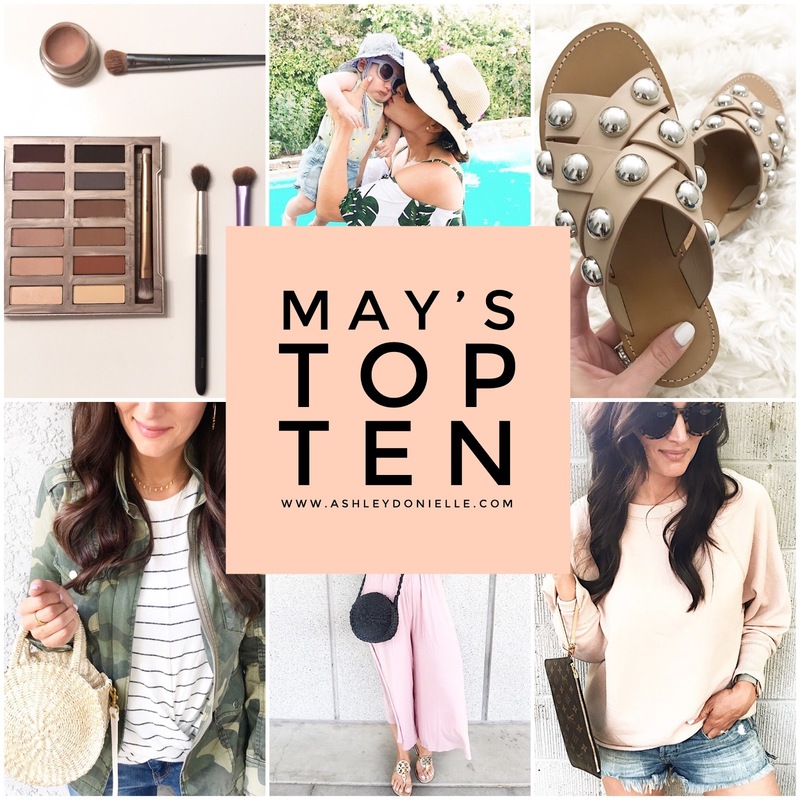 May was a HUGE shopping month (probably because of all the holiday sales) and this month’s top ten was a close one! This was one of my biggest months with clicks to purchases from you guys SO THANK YOU! You are truly the best followers and readers a girl could ask for! If you are new to following me or new to reading my blog on a regular basis, every month I do a “Top 10” series. I show the top 10 items that you guys purchased from my blog and Instagram based on my RewardStyle analytics. I always love doing these posts because I get to see what you all love shopping the most and it really helps me with creating my content for the month ahead. Per usual, I’m doing a “thank you” giveaway for you guys at the bottom of this post, so make sure you read all the way to the end! Now, let’s get into May’s top ten shopped items! I can’t even begin to express my love for these jeans. They are super distressed and I just feel “cool” every time I put them on. I usually wear my normal size in all AE jeans except for this style. They run big, so I size down in these. I recently just pulled the trigger and got the regular denim style and I’m loving those just as much! The website describes them as “cool without trying to hard” and I couldn’t agree more. Talk about the perfect everyday striped tank! This tank is a great layering piece for all your summer outfits and is less than $13! When I ordered this swim suit online, I had very low expectations. It was an Amazon find for under $20 and I got free shipping with prime, so why not?! Well, it came in the mail, fit like a glove and is absolutely so flattering! 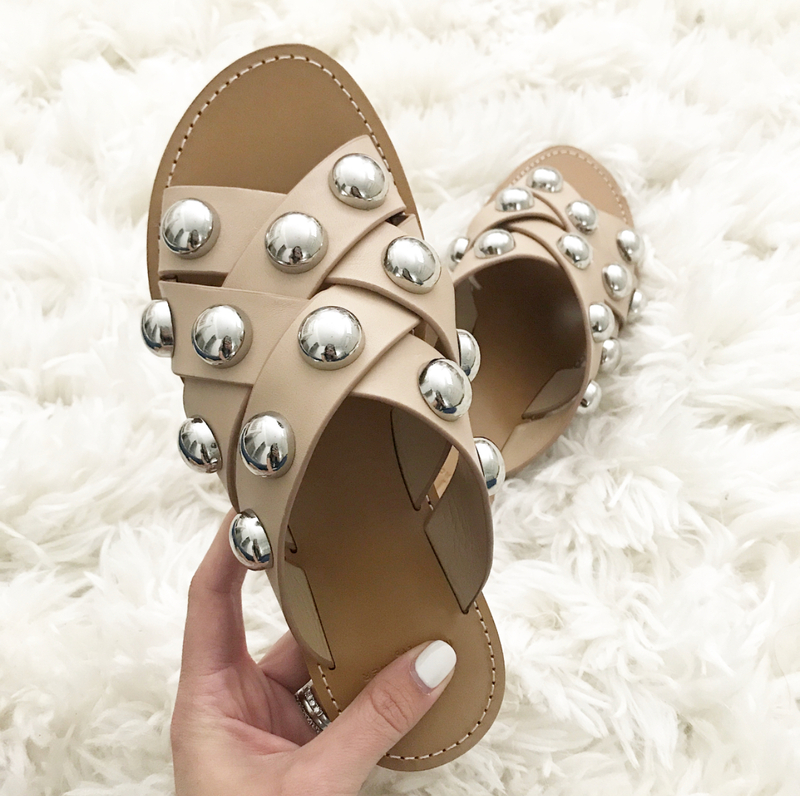 I had these studded sandals in my cart for over a month before actually purchasing them. They were pretty pricey for a pair of sandals so I wasn’t sure if they would be worth it. Just like the Miller sandals, they are worth every penny. Every time I wear them I get stopped and people comment on how much they love them. Winner winner! If you grabbed these sunnies while they were majorly discounted, WAY TO GO! They are now back in stock here but sadly full price….boo hoo! I’ll keep an eye out though and if I find them again for a great deal, I’ll be sure to let you know on my Instagram page. If you don’t own a kimono yet for summer, jump on it! They are majorly on trend right now and look so cute with distressed shorts, a jean skirt or just jeans. You guys LOVED this one this month and I’m not surprised one bit. It’s absolutely adorable, perfect for summer and looks good on ANYONE. I’m not lying when I say that I’ve been LIVING in this super comfy sweatshirt for the past month. I bought it in two colors, might need a third and it’s still on sale for $22! Run and get yourself one of these babies, you won’t regret it! I was shocked that over 100 of you picked up this eyeshadow palette last week! I showed you guys how I used it over on my IG stories (it’s saved in my highlight reel under “makeup” if you missed it) and the good news is that it’s still on major sale. It would make a great gift for a girlfriend, sister or mom as well! 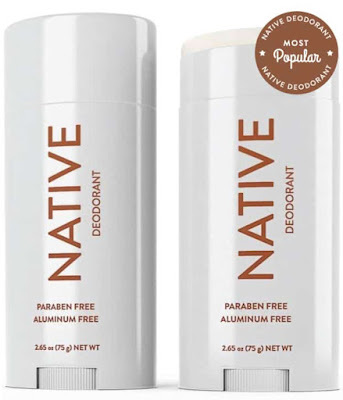 Ok, I did a quick little story about how I was ordering this natural deodorant and so many of you grabbed yourself one as well. I haven’t tried this yet, but I’ve heard so many great things from friends and other bloggers, so I can’t wait to get my in the mail next week! (I got the coconut & vanilla scent). I think that this poncho was the biggest hit of the month by far! Over 300 of you ordered this comfy, soft cutie and I’m not surprised at all! It was majorly marked down, stocked in all sizes and was just too good of a deal to pass up! It’s still on sale, so if you didn’t grab one yet, don’t miss out! 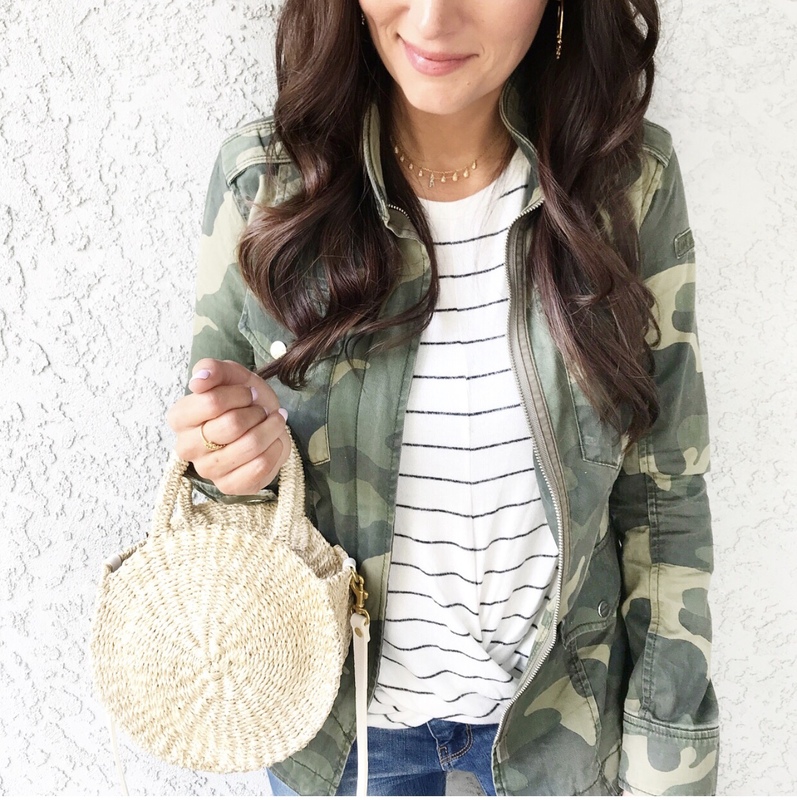 So many great items this month and most of them were on major sale! Win Win! 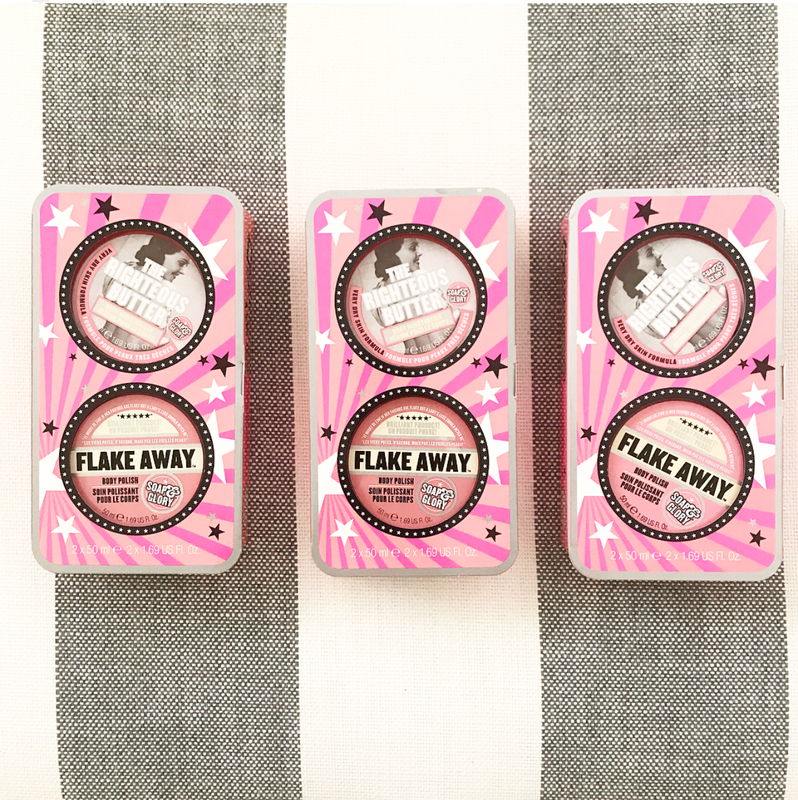 For this month’s giveaway, I’m gifting THREE of you with these Soap & Glory body scrub sets. These are perfect for this time of year, as they keep your skin hydrated, glowing and are perfect to use before you apply your self tanner. 1.) Like my last 3 photos on Instagram. 2.) Follow Ashley Donielle Blog on Facebook. 3.) BONUS ENTRY – Follow me on Pinterest. Once you’ve done all of the above, fill out the rafflecopter below and you are good to go! Winner will be announced on Monday night!